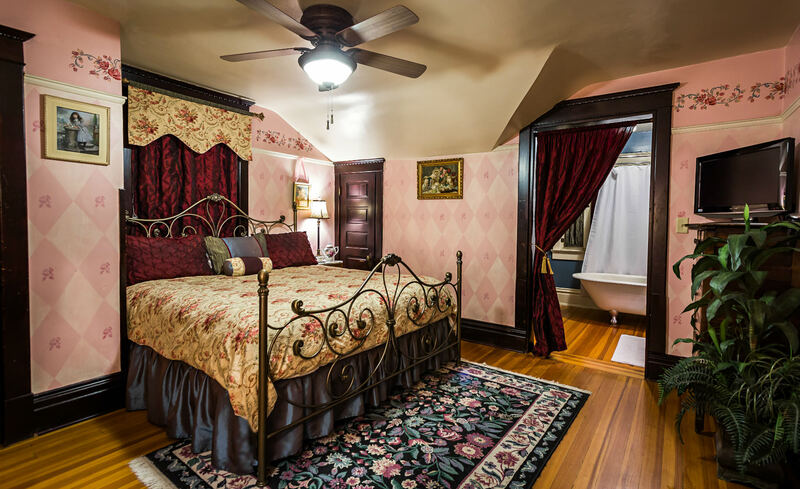 A beautiful Victorian room in the Spy House portion of our New Mexico bed and breakfast; features a king-size bed and private bath with claw-foot tub/shower. The Freeman Room pays tribute to Margaret Freeman, the owner of the house from the 1940s until her passing in 2001; she and her husband were the owners of the house when the Greenglasses came to rent one of the upstairs apartments. The hand-painted diamonds on the walls are made to look like a replication of antique wallpaper, while the rose border at the top of the picture rail was lovingly hand-painted by Kara’s mother to match the roses in the bedspread. 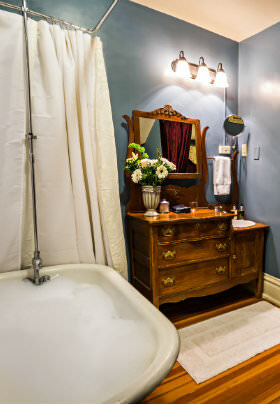 The private bath has an antique claw-foot tub to soak in – or you can use the shower if you’d rather. The 1800’s washstand has been converted to feature an actual working sink.